! Murcia Today - Fuente Álamo Pedanías, La Pinilla. 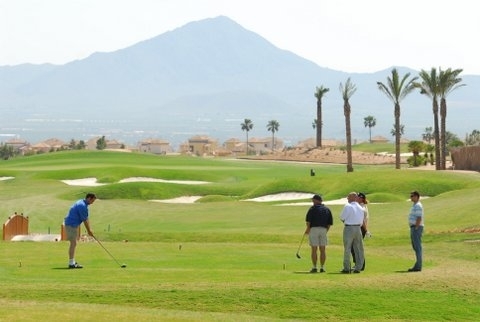 An introduction to La Pinilla, Fuente Álamo, Murcia. 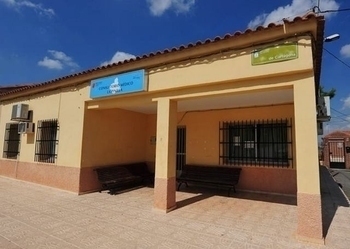 La Pinilla is a small pedanía located in the south-west of the municipality of Fuente Álamo, and is one of the villages which grew up along the route of the old "Camino Real" , the main road, between Cartagena and Lorca. The village was always a farming community, most of the local economy today based on agriculture, pig and chicken rearing concerns replacing the non-irrigated dry land activities such as olive and almond farming. Other members of the local community work outside of the village, there being very little alternative career paths. The tale of La Pinilla begins 12 million years ago - various fossils have been found in the area - and there is also some evidence to suggest that there were Roman and Moorish settlements nearby, such as the old Barrio del Fortín. 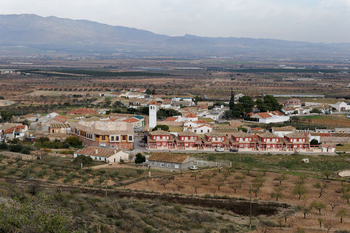 The population suddenly grew in the middle of the twentieth century, when a new area of cooperative housing was built, but a later period of emigration and the re-invention of crop farming in the surrounding area have made La Pinilla the residential agricultural village it is nowadays. Click for map, La Pinilla, Fuente Álamo, Murcia. A brief history of La Pinilla. 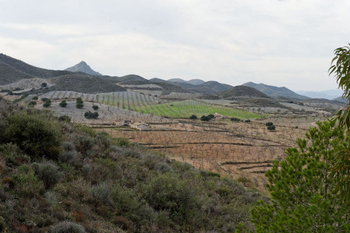 A large number of fossils have been found in parts of the area surrounding La Pinilla, such as the Finca de Los Montesinos, El Majar de Gracia and Las Cuestas. 12 million years ago, this area was underwater. The various strata in which the fossils have been found correspond to coastal, shallow water, most of the fossils discovered so far belonging to creatures which lived in relatively shallow waters, including various types of coral, which seems to indicate that the water here was very warm at the time. There is an area near to the former railroad ( see below) which is particularly rich in fossils, and in case there are any enthusiasts amongst readers, include the following: Ostrea Crassissima, Cardium Edulus, Strombus Almería and Comus Mercatí. 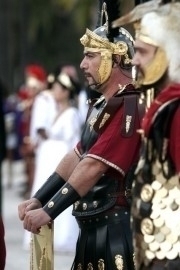 The Romans in La Pinilla. The Romans invaded Cartagena( Carthago Nova) in 209BC, and set about not only building infrastructure throughout the region, but also setting up trade routes to move the raw materials and natural resources of Spain throughout their vast empire. Some of the existing trade routes used by the indigenous population and their trading partners were brought under the control of the Empire, the road linking Carthago Nova ( Cartagena) Eliocroca (Lorca) and Cástulo (Jaén) passing directly through La Pinilla. Next time you drive along this road, have a look, yes, it´s straight! 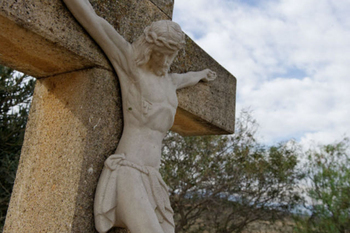 As the centuries passed, this road became the Camino Real between Cartagena and Lorca. 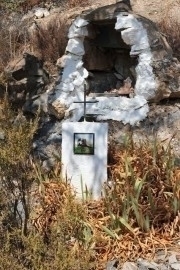 There are Roman remains from the 3rd century BC scattered in various places along it ; El Raal, Fuente Pinilla, Pantaleo, Casas de Egea, Cueva de Pagán and Cabezo del Sordo, a Roman tombstone being found near to Pantaleo. This is now on display at the Archaeological Museum in Cartagena. The tombstone bears a touching inscription penned by the deceaseds sister: "I believe that, his flame having been extinguished so soon, he has been deprived of moments of happiness, but has also been spared bitter memories". The Arabs in La Pinilla. After the 4th century and the departure of the Romans, Cartagena was subjected to a number of invasions, the most permanent being that of the Visigoths. By early in the 8th century, Arab invaders from Africa were sweeping across southern Spain and in 713 the pact of Tudmir was signed, which allowed Arab settlers to take up farming in peace, in co-operation with a negotiated Visigoth Governer for the area. The Arabs became the dominant population by the 9th century. Some historians believe that the name of the La Pinilla comes from the Arabic "Ben-iella", meaning "daughter of the pact", from which the name of Fuente de la Peniella is derived, Fuente being water source or spring. There is no documentation related to the village from the period when it was under Moorish rule, and the evidence of human activity in this time is limited to a few remains in El Fortín, Cueva Jara and some evidence of fish-ponds. This lack of documentation has led to lots of speculation about the nature and extent of Moorish settlements in the area, but most probably the Moors would have chosen to live close to sources of water, and would have built wells, ponds and irrigation ditches. Caves like the Cueva Lara were dug out and turned into little oases in the enormous dry plains. This area again changed hands in 1243 when it was the subject of another pact, which gave control to the Christian Castilian forces of Prince Alfonso, who later became Alfonso X, El Sabio, the wise one. There is little information about the area at that time, although it did undergo a depopulation following an uprising of the moorish citizens in 1266, many of whom were subsequently expelled from the area. It is known that in the 16th century the village belonged to the Township of Lorca, and was part of the area which began to be repopulated in the Campo de Cartagena. 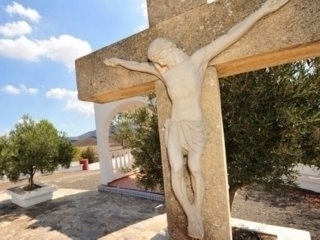 Encouragement was given to those repopulating and revitalizing the countryside in Lorca, Librilla and other neighbouring municipalities, and it is believed that the growth of the village began in the area of El Fortín, where the first church was built. The first documented reference to the church dates from 1748 in the will of one of the inhabitants of the village. The "villa", as it then was, probably passed into the hands of a rich landowner from Lorca at around this time, and after 1820, when the municipal boundaries of Fuente Álamo were defined, La Pinilla had to wait 26 years before being able to free itself from Lorca and form part of Fuente Álamo. This was a period of bitter arguments with the Town Hall in Mazarrón over the ownership of the Fuente de La Pinilla and the Cabezo de la Calera. In the early part of the 20th century, a time of hunger, pestilence and crop failure brought misery to the residents, but as the century progressed there was a period of relative prosperity. In the 1920s, under the dictatorship of Primo de Rivera, a new program to build more infrastructures was begun, and this plan included the construction of a railway line from Cartagena to Totana. The railway promised to end the isolation of La Pinilla and stimulate further growth, but these hopes were dashed when General Berenguer came to power in 1928 and work on the line was halted. Part of the proposed route of the line is still used as a rural track, but otherwise no vestige of the railway remains. Public schools were built in the village in 1935, one for girls and another for boys, thanks to funding from the Town Hall of Fuente Álamo, but the outbreak of the civil war in 1936 brought to La Pinilla the same conflicts as in all other areas of Spain, pitting brothers against each other. Cartagena was close by, and it was not unknown for villages nowhere near the City to be hit by stray bombs during the fierce bombardments which took place during the war. Fearful that pilots on unsuccessful bombing raids might release their bombs over the area on their way back from missions, it became commonplace for locals to seek shelter in the caves each night until the raids were over. 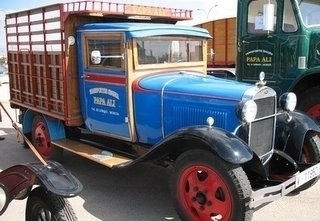 After the war ended in 1939 there began a hard post-war period for the residents of La Pinilla, the economic hardships of the period being exacerbated by the residual bitterness felt by supporters of both sides in the struggle. 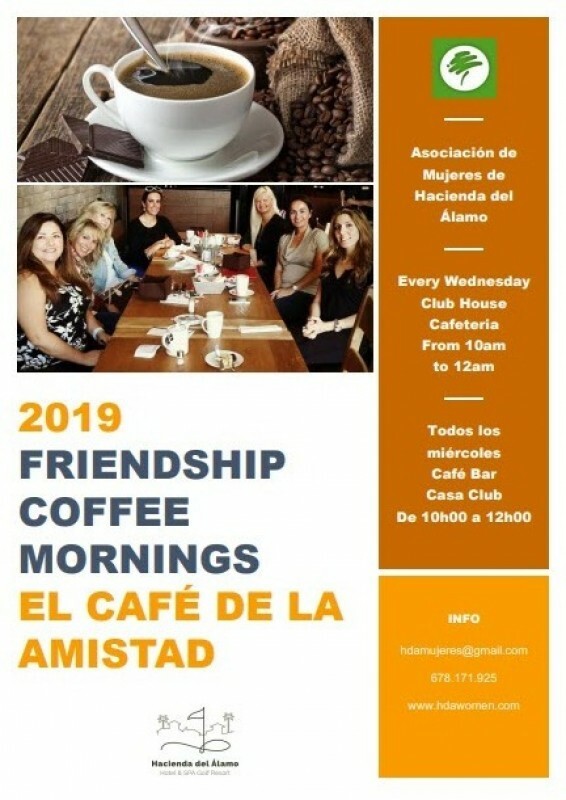 Some left the town to escape these residual quarrels, some to fight on elsewhere in different causes (such as Miguel Marín, who joined the French resistance) and others simply to start life anew in fresh fields. For those who remained in the village these were two decades of drought, disease, fear, misery and, above all, hunger. Those who remained became a hardy population of farmers, agricultural workers and shopkeepers. La Pinilla was hooked up to the national grid in 1942, when it became the first village in the area to receive electricity. The installation was carried out by a private company belonging to Joaquín Payá in Cartagena, and one of the streets is still named after him. Despite this, though, the village remained a very traditional community, with religious affairs very much at the centre of everything that went on in it, and nothing really changed until the arrival in 1953 of a new priest, Antonio Gómez Ruiz. In the eight years he spent here he introduced a series of forward-thinking changes, including the construction of the church tower in 1957, making it the highest building in the area at the time. 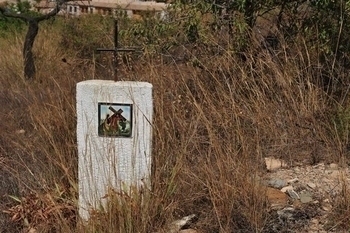 The cemetery was made presentable, trees were planted, a kindergarten was set up, a group of 32 new houses was built and running water was brought to the village (previously it had been necessary to bring drinking water from the other side of the cemetery, more than a kilometre away). Sr Gómez even oversaw the organization of communal trips to the seaside in Isla Plana, where the children escaped from the hardship of their daily existence for a few days every year. In July 1960 the first telephone in the village was installed in the house of Antonio Madrid, although it was later moved to the bar belonging to Joaquín Barcelona, and in 1968 work was completed on the updating of the areas sewerage system. Today part of the land around the village is still used for dry crops, and some of the inhabitants are employed in local pig and chicken farms. 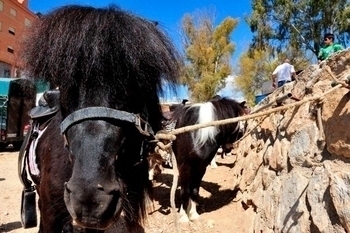 The proximity of Mazarrón, with its growing services sector, and Fuente Álamo with industrial activity offer better work prospects for the younger population, and the village is now mostly residential. Church of La Pinilla, La iglesia de Nuestra Señora de Montserrat. This little church has a single Latin-crossed nave, with four sections and an adjoining chapel on the side of the epistle. One of the sections is crowned by a hexagonal dome, which in turn is topped with an iron cross. The main façade faces west, and the wooden door is decorated with geometric patterns. 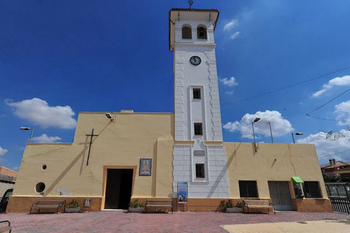 A tiled image of Nuestra Señora de la Luz can be seen in the upper right-hand part, as well as a plaque commemorating the origin of the clock which is housed in the tower. The church was originally dedicated to the Virgen de Montserrat, but following the Spanish Civil War, devotion in the village was changed to the Virgen de la Luz, one of the few sculptures which escaped the ravages of the Civil war and which had been hidden throughout by villagers who concealed the image in their home for safety, carved by Sánchez Lozano. There are also images in the church of San Antonio de Padua and san Ramón Nonatao. The actual hermitage itself is the second one to have been built in La Pinilla, dating from the 19th century and replacing the first , which had originally been built in the El Fortín area of La Pinilla. The tower was added in 1956, and took 5 months and 15 days to build. The local villagers paid for the construction themselves, by seeking donations, and holding small theatrical performances to raise funds. Those who had no money contributed by supplying man power and labour, using their donkeys to lug the building materials required and lift the building materials up to the workers as the tower grew in height. The church is built on the site of one of the greatest treasures in the area, a freshwater spring. The Church was restored in January of 2010, the roof being an exact copy of the original. Mass is celebrated at 12.30pm on a Sunday. 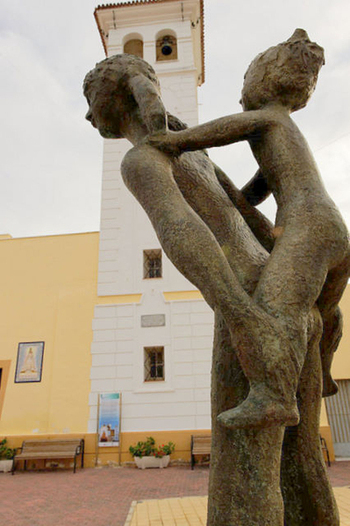 One of the newest additions to the village is a sculpture by Murcian artist Antonio Campillo, the figure of " A Coscaletas" presented to the village by the family of Madrid Conesa ( Los Penchos) in 2011. Campillo is one of Murcia´s best loved sculptors and another piece from this same model is in the Parque Escultórico Antonio Campillo in Central Murcia. The local fiestas are held at the start of September in honour of the Virgen de la Luz, the patron saint of the village since the middle of the 19th century, when for reasons unknown, she substituted the Virgen de Montserrat. In the area of La Pinilla known as Las Casas Nuevas is the Plaza de las Eras, where most of the public buildings are grouped together. These include the social centre, and it is in this square that the locals celebrate the events of the villages fiestas. The social centre includes a computer room with free internet access, where various courses and workshops are held throughout the year. All cultural events are based around the social centre, and the fiestas are coordinated and organized from here. Sports facilities are located next to the local primary school, with courts and pitches for football, volleyball and handball. The health centre and a childrens play area are also close by. Buying property in La Pinilla. During the boom years, this area was extremely popular with ex-pats. Ex-pats are attracted by the many country properties which are in abundance around the area, many having been reformed. 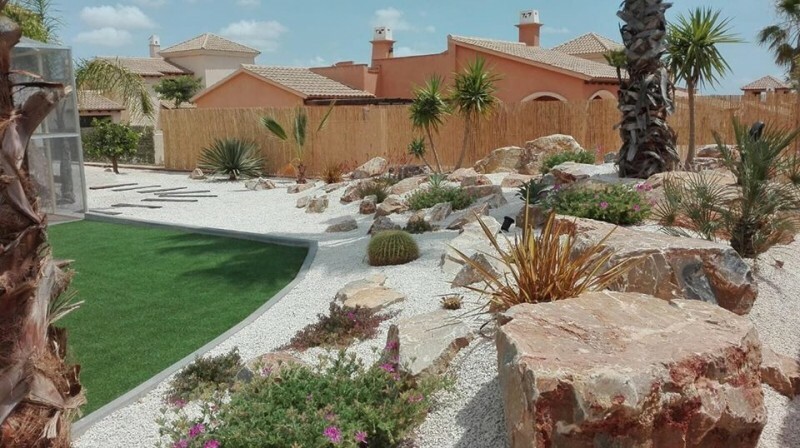 The area is just a few minutes from the coast and the beaches of Mazarrón, yet still essentially Spanish, with a sizeable ex-pat population nearby in the Mazarrón municipality, the Camposol Urbanisation being just a few minutes away. The area tends to attract those who like the security of being near to an English area, but don´t want to be in it and are seeking rural Spain. 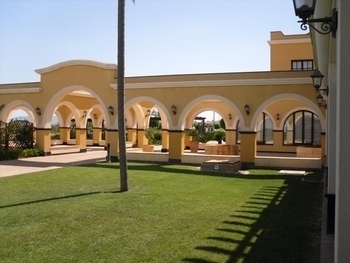 Infrastructure is good, the San Javier airport about a 40 minute drive, although once the new Corvera International Airport opens in 2012, this will be reduced to 25 minutes. 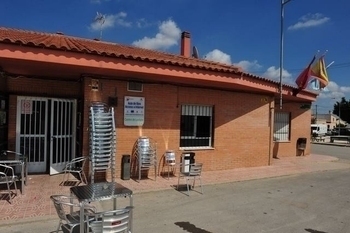 La Pinilla has a bar/restaurant and medical consultorio. It´s a really calming location, and a great little walk for Camposol residents, being just a very short drive away.